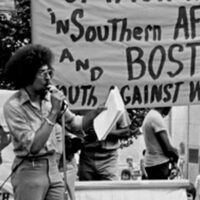 Join us for a lunchtime screening of The Bay State Banner: Unity, Progress and 50 Years of Advocating Change by Tracy Strain and Randall MacLowry (USA, 2015, 25 min.). The Bay State Banner is an independent newspaper that has served Boston’s African American community for more than 50 years. This film offers a glimpse of Boston through the eyes of the African American community. Produced and directed by award-winning filmmakers Tracy Strain and Randall MacLowry.